The latest news is a disaster. Wicklow County Council has shown their lack of concern for the River Vartry and in a foolish moment, decided to grant Irish Water permission. This could be considered shrewd, as they were aware that we would take this to An Bord Pleanála and this way they do not incur the wrath of the Government by doing something against them. 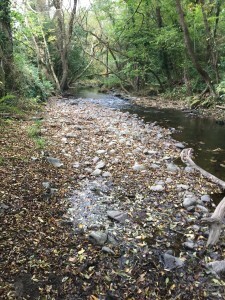 What is surprising is the total lack of concern for the environment by Wicklow County Council, the Government, Irish Water, the EPA and the media. I see articles in the news all about the wonderful plans to spend €250,000,000 on water infrastructure but not a mention of how this might affect the Environment. Irish Fisheries did put in a strong observation in the planning stage but have become uncomfortably silent. 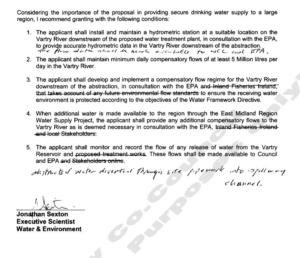 “The applicant shall maintain minimum daily compensatory flows of at least 5 Million litres per day in the Vartry River, in accordance with the details submitted on the 3rd of November 2016”. This will enforce on the River 1/3 of the current flow of 15ML per day. As well there is no enforced specification of what this water is. The Treatment Works has a poisonous discharge that can not be dumped in the river, but there is nothing in this condition to say that the 5ML is clean water. The file does contain an unworkable solution for dealing with the discharge of pumping it back over the dam into the reserviour. 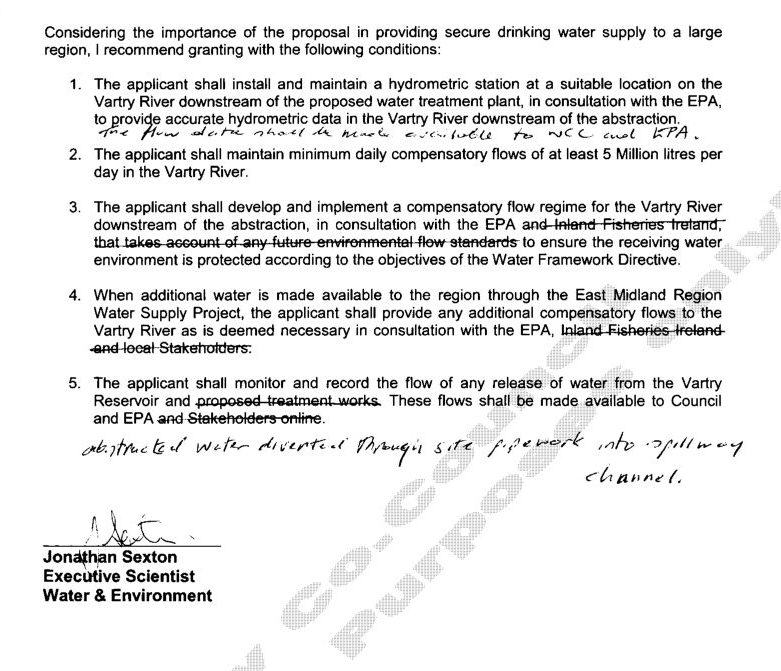 This we objected to on the basis that it would pollute the top of the reserviour eventually causing the water going to Dublin to be compromised. This solution was never meant to be followed and eventually the discharge will be dumped directly into the River, after it is destroyed from lack of water. This is part of our Appeal to ABP. Reducing the flow in the river to 1/3 its present state can only be seen in a picture from the top of the Vartry by the reserviour. This is how the whole River will look if this decision is not fought. To put things into perspective, with a flow of 15ML per day in the end of November 2016 the river above the Weir in Ashford looks like this. 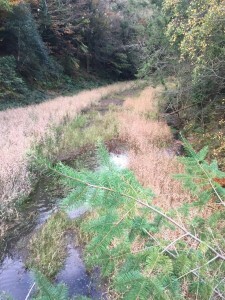 This is spawning time and the fish have to pass through this narrow channel. Imagine now this scene with 1/3 of this water and the fish growing tiny legs to walk up the river. Although I joke to get you to imagine, it is not a joke. This is the true reality behind what is being done by the Government, WCC and Irish Water under the watchful eye of the EPA, Irish Fisheries and other that have not seen the truth. This is an EU protected river and even so, it is being treated like this. We do not what to wait for the “woops, sorry”. I call this, “Government By Intimidation”. Nothing seems to happen without intimidation. The Government intimidates the County Council “We need housing! Build more houses where they shouldn’t be!”, “Don’t oppose Irish Water!”. The only way forward for ourselves is to use the same tactics and Intimidate the Government by pressing the media and asking all of you to join in our campaign to reach An Bord Pleanála, in force, with many people behind us. Can you please join our campaign and donate to our Crowd Funding project? We now have to pay a Barrister and several Hydrologist and Hydrogeologist to help us make sure we win at ABP. As well we need a “War Chest” for future fights in the High Court and perhaps the Supreme Court, if necessary. Thanks for your support and joining us in this fight.